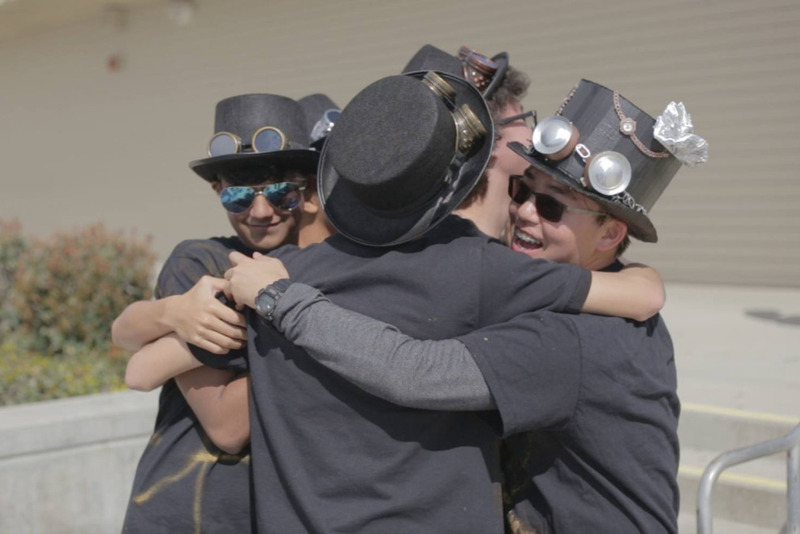 Odyssey of the Mind inspires students across the globe to work together, face unique challenges and think outside the box. Teams compete in almost 30 countries and yet hardly anyone we meet even knows the program exists. So we've set out to follow a team, capturing this incredible problem-solving process for all the world to see. You might say we're Odyssey lifers – local, state and international volunteers who love sharing this experience with new generations of students. And for us, it's personal. Because once upon a time, we were students...who happened to form an Odyssey team...and who eventually grew up, got married and decided to make a movie. But we need your help! We've started this project, and we can't finish it on our own. Expenses are looming: file storage, editing, music and color correction, just to name a few. Every little bit helps, so contribute if you can, and stay tuned for updates! Friday morning came with the exciting news that we'd reached our goal here on GoFundMe. And by Friday night, we were off to Riverside to film at the SoCal state tournament. We're closing up shop here at GoFundMe, but we wanted to thank you all as well for supporting this campaign and helping us get the word out. We hope you'll follow us on social for updates, and we look forward to sharing the finished film with you! Thanks for all you've done to make this project a reality! Well, friends, this is it! Tomorrow’s a big day for us and an even bigger day for our team. They’ve spent six long months developing their solution, and tomorrow they’ll compete at the SoCal state tournament for a chance to go to Worlds. We’ve been so incredibly lucky to spend all this time with such an amazing group of boys. Their friendship, creativity and perseverance could not better depict what Odyssey of the Mind is all about. This morning we celebrated crossing that $15,000 line – WOOHOO! – but the fundraising doors won't close for one more day. Costly post production is just around the corner, and while we don't know yet if our team will advance, our crew WILL be traveling in May to film at Worlds. So, if you’ve been thinking about making a donation, or you know someone who has, now is definitely the time. Every dollar raised will help us make a better film. Keep an eye on our Facebook tomorrow, as we’ll be posting updates throughout the day. And please take a moment, before it’s too late, to share this campaign. Thanks to all our supporters near and far! Woohooooo!! Our team is on their way to States! Saturday was a big day for them AND us. The team competed at their Regional tournament, and with the help of an outstanding crew, we were there to capture it all. In fact, Saturday marked our biggest shoot to date. We'll continue following our team over the next two weeks as they prep for States. And after that? There's a very real possibility that we'll be able to film and collect interviews at Worlds...which is great news for us, but it also means higher production costs. As of today, we're just 10 days to the end of our fundraising. If you haven't given yet, now is the time! And if you have, please share this campaign. Don't forget, every donor – no matter the amount – will receive a digital copy of our finished film! Thanks to all of you for supporting this project! Okay, friends. It's crunch time. For more than five months, this team of smart, funny, incredible boys has invited us into their practices week after week...but now tournament season is officially here. Our biggest shoot days are just ahead, and while the camera may stop rolling next month, we've still got A LOT to do. In fact, the majority of our budget is slated for post-production costs like editing, sound, music and color correction. We have to reach our goal by March 23rd, so today we're kicking off our final 30 days of fundraising with a throwback to our very first shoot. Check it out below! Even if you've already given, please take a moment to share this campaign. Every dollar helps, and every donor – no matter the amount – will receive a digital copy of our finished film.